Here follows the abstract of the oral communication presented by Prof. Andrea Tintori at Eudimorphodon Symposium on november 7, 2003; it represents the best and updated introduction to the locality and faunas from the Zorzino Limestone, thus it is reported here. the section on reptiles, the paintings and drawings (maps excluded) are mine. THE NORIAN (LATE TRIASSIC) CALCARE DI ZORZINO FAUNA FROM LOMBARDY (NORTHERN ITALY): THE STATE OF THE ART. Dipartimento di Scienze della Terra, Via Mangiagalli 34, I-20133 Milano. At the beginning of the seventies, the first fossil locality in the upper Calcare di Zorzino (Zorzino Limestone = ZZ) was discovered near Cene (Bergamo), and it was thought to be a lucky, but single event. Several hundreds of fishes and crustaceans and a few reptiles, among which the oldest known pterosaurs, saw the light from a 6 cm bed, that had been exposed when the overlying layers slided down during quarry works. Most specimens were recovered by the staff of the Bergamo Museo di Scienze Naturali 'Caffi' and by Prof. M.Gaetani and myself, at the time an undergradued student of this Department. Unfortunately several specimens have been collected by amateurs who have either sold them or kept them at home without any notice. Within few years it was clear that the Cene site was not an exception in our Norian and, thanks also to collaborative amateurs, many other localities were discovered in the Bergamo and Brescia Prealps. Not all of them were suitable for regular field work, because bed surfaces were too small. In fact, to collect fossils in the ZZ we must open 'paleontological quarries', but the available surface must be wider than several hundreds square meters so that the preliminary work can be rewarded by long collecting seasons. From 1975 to 1993, I have been responsible of field works in three main sites (Brembilla, Zogno-Endenna and Zogno2) while the Bergamo Museum exploited mainly the Ponte Giurino locality, in the Argillite di Riva di Solto (Riva di Solto Shale = ARS), a few dozen of meters above the ZZ/ARS boundary, and recently also the Cene quarry has been surveyed. More or less coeval localities (Seefeld and Hallein in Austria, Giffoni near Salerno in southern Italy) have been known since the beginning of the last century. They yield only few taxa, usually common to the ZZ fauna: the latter appears much richer, but possibly only because of these twenty years of regular collection. Also less diversified are faunas from the 'Rhaetian' Bone Beds of Central Europe and England, where erosion and transportation selected only some of the hardest elements such as teeth of durophagous or large predatory fishes. Recently, the UNIMI palvert group tried to reopen an excavation in a early Norian site in the Val Garza (Brescia): very promising material have been recovered and prepared. Most of the fishes appear to be new genera and species, so this fauna looks quite different from that middle-late Norian of the ZZ. The material is now housed in the Brescia Museum of N.H.. Other sites, possibly of intermediate age between the ZZ and the Brescia faunas, have been discovered in the western part of the Lombardy Basin in the M.Generoso (Como) trough. Thus, it will be possible that in the future we will have a very detailled faunal sequence covering most of the Norian. However, as all of us know very well, to make excavations, preparing the material and study it, is a very long way that need first of all a good ammount of money, possibly from the local communities that should be interested also in the pubblic diffusion of the local paleontological heritage after its study. Unfortunately, after collection, our specimens need a long mechanical preparation to expose the fossil. The use of chemical technics is prevented by the matrix composition, shaly marls to marly limestones: acid in fact, not only works on the surface, but seeps through the rock attacking unprotect fossil from side and below. Furthermore, the shaly portion and the organic matter content (usually around 1%) form a superficial film which requires an additional treatment with organic solvent before further acid attack: results are never good enough. The geological setting of the Lombardian Norian has been studied by collegues of this Department since the discovery of fossil localities. The ZZ was deposited in several, small (width up to several kilometers) semigraben basins inside a huge carbonate platform extending from Spain to Greece. Basins resulted from transtensive tectonics, probably related to the rifting of the Ligurian-Piedmont ocean. Being surrounded by very shallow environments, they had a restricted water circulation which led anoxic conditions to develop in their deepest part especially in correspondence to the Middle/Late Norian transgression that is represented by the passage from the ZZ to the ARS. The only connections with open sea was throughout long tidal channels which acted as ecological barriers for large nectonic organisms such as ichthyosaurs, which actually have been never found in this area. The carbonate platform, owing to warmer and more salted waters, was probably poorly inhabited. The organic mounds surrounding the basins could emerge, giving rise to ephemeral islands colonized by the cheirolepidiacean conifer Brachyphillum, which can survive at least in brackish waters. Thus, all fossils from the ZZ must be considered alloctonous, yet they are intrabasinal like marine organisms. Mainly nectonic, but also benthic and terrestrial organisms are represented in the ZZ fauna, allowing the restoration of the shallow marine environments and of the nearby emerged land. The high number of specimens and taxa together with the nice preservation of almost all the material induce us to consider these Norian localities as Konservative Fossil- Lagerstaeten though soft tissue preservation is very rare. The fish fauna from the ZZ is the richest of the Triassic if we consider a single fossiliferous level: at least 25 genera have been already described or are under study, while several others have been simply recorded in the collections, waiting for more specimens to be prepared. Thus probably more than 50 genera are represented, ranging from about 2 cm in standard length up to the 180 cm of the longest Saurichthys so far known. A few species are represented by hundreds or thousands of specimens, like pholidophorids, several others by dozens and many others by few or single specimens. Apart from the numbers, this fauna is important because it records the first important radiation of neopterygians at a time when paleopterygians were still important, especially at the top of the trophic hierarchy. In fact, all the large predators are basal actinopterygians (=Paleopterygii): Saurichthys, Birgeria and the peltopleuriform Gabanellia can be considered as the high-level predators, together with a couple of coelacanth genera. Furthermore, Saurichthys and Birgeria are known throughout the Triassic, showing their optimal adaptation (see also Gozzi, this volume) to active predation on small fishes, both paleopterygians and neopterygians. A peculiar chondrostean is Thoracopterus, a flying (gliding) fish also known from the Carnian sites of Raibl (Italy) and Lunz (Austria). 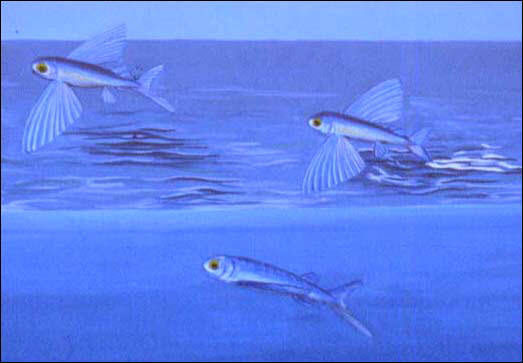 As far as I know these are the only sure fossil flying fishes before the modern exocetids of which they achieved the same way of gliding. 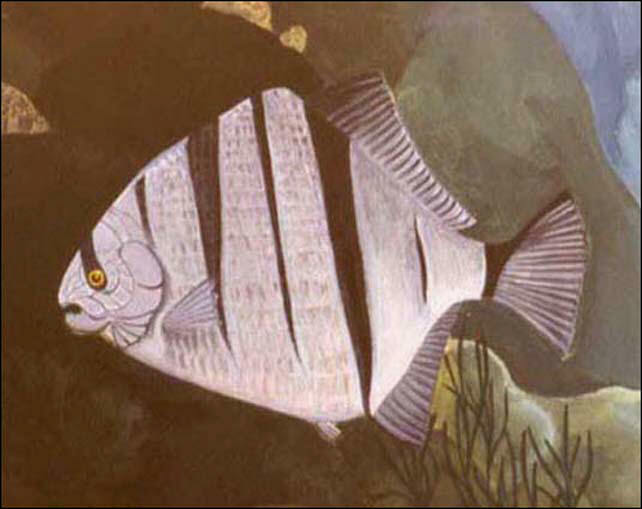 Regarding neopterygians, the several pholidophorid species were by far the commonest fishes, reaching about 70% of the collected specimens, but also durophagous fishes bloomed. Macrosemiids (Legnonotus and a new genus), pycnodonts (Brembodus, Eomesodon, Gibbodon and a new genus from Early Norian of the Brescia area) and semionotids (Paralepidotus, Sargodon, Dapedium, Dandya, Semionotus) are very well represented. Paralepidotus was probably the commonest among them and is now very well known also in its ontogeny, collected specimens ranging from 7 cm up to 50 cm in standard length. Durophagy seems to be the 'new deal' for neopterygians: the changes in the suspensorium rendered the closing of their jaws much more powerful so that many new groups entered a large trophic niche till then underexploited. Each of these species shows a peculiar dentition: prehensil teeth are present or absent and variously shaped molariform are arranged in more or less regular rows. 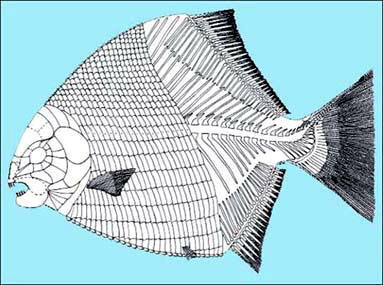 Body shape and size vary also a lot: from fusiform macrosemiids to discoidal, laterally compressed pycnodonts; from few centimeters (Dandya, Eomesodon) up to one meter (Sargodon). The result of these variations is that different species exploited similar niches without interferring with one-another. Ejecta, coprolites and coquinas made of shell fragments, witness the great feeding activity on benthic molluscs. On the other hand, very few are the hybodont remains, usually concentrate and common in the 'Rhaetian' Bone Beds of Central Europe. Here, the only widespread 'shark' is Pseusodalatias barnstonensis: its remains are made of tooth-rows with 11 teeth symmetrically arranged and are found by the hundreds. All specimens show complete tooth-row and teeth have no wear traces or broken apex at all. Furthermore, tooth-rows are always found alone. As I do not believe that they are all sheded tooth-rows, with no actual individual preserved, this let me think that Pseudodalatias might not be a shark. Unfortunately, also because no traces of the body are known, no other sound hypoteses can be forwarded. Norian scenario in Northern Italy: on the foreground a Drepanosaurus (head is fictional) rests on a tree, a tiny Diphydontosaurus lurks over a coleopteran, Endennasaurus is emerging from water, while Langobardisaurus peeks over the bank, behind them Aetosaurus is basking, Psephoderma is entering the water, while Mystriosuchus has just catched a fish; on the tree branch Megalancosaurus has an insect in its jaws. Pterosaurs (Eudimorphodon and Peteinosaurus) are flying over the sea. Though numerically speaking it is the poorest section of the ZZ fauna, yet reptiles are very important for the presence of endemic genera and of the oldest pterosaurs so far known. Curiously enough for the preservation environment, most reptiles are terrestrial with land, arboreal or flying specializations. Only the thalattosaur Endennasaurus and the armoured placodont Psephoderma could spend part of their life in water, especially for feeding. R. Wild carefully described the beautifully preserved pterosaurs from Cene, while the completion of reptile work has been undertaken by S.Renesto. His work indicates the presence of arboreal forms such as Megalancosaurus and Drepanosaurus (See Renesto, this volume), plus a new genus still under study by R.Wild . The ephemeral islands with Brachyphillum could well have supported flying and arboreal reptiles, feeding on insects. Land reptiles are Langobardisaurus and the sphenodontid Diphydontosaurus, as well as Aetosaurus and Mystriosuchus. The former two could have lived on the small islands, while the life site of the latter two is more problematic, also because they only are common to the Norian continental deposits (Stubensandstein) of Germany. Taphonomically speaking Aetosaurus is different from the other reptiles: only one small fragment has been recorde, while all the others count articulate more or less complete specimens. This is true also for Mystriosuchus, known also by a complete individual, the most complete one of the genus. The endemic reptiles are usually small sized, very lightly built, and often have hollow bones. They could not have survived a long post mortem transport in superficial oxic and warm waters, while Aetosaurus, possibly from a larger land, floated for a long time, loosing body fragments along the way. All the invertebrates point to a quiet, normal marine environment all around the basins so that the superficial waters were also suitable for marine life. Most of the ZZ fossils are nicely and completely preserved in their hard parts: thus, they had to live not far from the environment in which they became entrapped and preserved. No traces of soft parts have been detected: possibly, the sedimentary rate was too slow to prevent a complete decay, even in an anaerobic environment, before being covered by the sediment. Bottom anoxia was not the rule during the ZZ deposition (laminated beds are quite rare), perhaps owing to the scarce organic productivity on the carbonate platform and to the turbidites which reworked the waters, preventing their stratification. Basin bottoms became firmly anoxic when pelites appeared, following the beginning of the transgression at the Middle-Late Norian boundary. The main fossiliferous level is coeval with this transgression, which perhaps enlarged the oxic rim, allowing a wider bottom colonizzation and enhancing the organic productivity. A major input of organic matter promoted bottom anoxia which allowed fine fossil preservation in thinly laminated rocks. Though these levels are rich in fossils, specimens are always sparsely arranged on the surface of each lamina. Mass mortality events were limited to very few episodes. Attritional mortality is sufficient to explain the very high number of specimens, if we consider the very long deposition of the whole fossiliferous levels. Fishes exploited a number of ecological and trophic niches, both near the bottom and in the superficial waters. 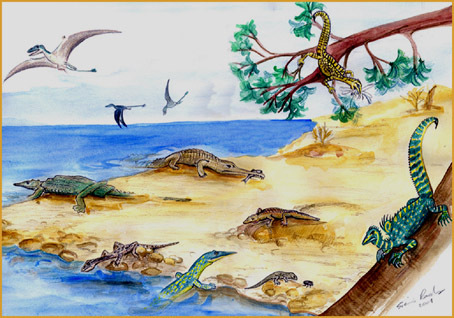 Ephemeral islands, supporting tree vegetation, must have existed close to the basins, because the small and lightly built reptiles could not suffer long exposures to an oxic environment after death. This land was far enough from the continent to give rise to a peculiar and endemic reptile fauna mostly related to trees. Likely, gliding and flying from high trees were the most common way of moving of these terrestrial animals living on small rafts in the middle of a marine environment.